During the JANET Carrrier Ethernet Trial we we took part in, I needed to plot some data based on our testing and came across gnuplot. It is actually quite simple to use and we’re doing so more and more so I thought I share some of what I’ve learned. First you need to generate a text file of data which you wish to graph (whitespace is fine as a delimiter). Install gnuplog on the server you are using. At the time of writing it available natively in RedHat and Debian. You need to generate a config file, # man gnuplot is your friend here. set ylabel "Number of uniqe visitor users"
set title "Visitor Users over time"
plot "/home/networks/unique_visitors.csv" using 1:2 title "Visitors"
You can then use a cronjob to update the data and replot the graph regularly. If you would like to manipulate the data you are plotting on the fly, for example to scale something down, you can. An example is probably best here. 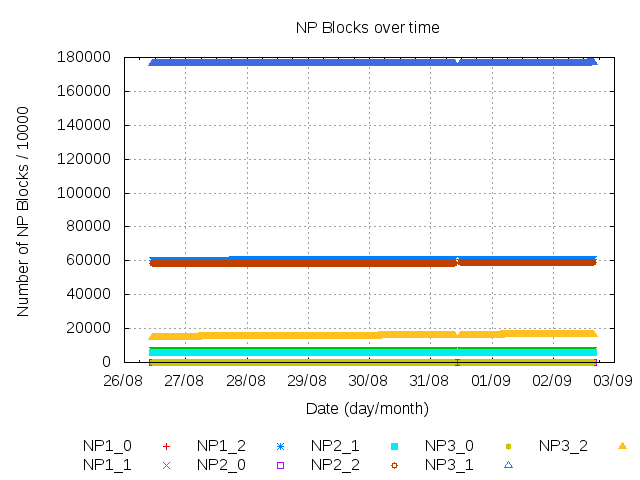 set ylabel "Number of NP Blocks / 10000"
# set ylabel "Number of NP Blocks / 10000 (log)"
set title "NP Blocks over time"
"" using 1:($10/10000) title "NP3_2"
Hopefully that has been a useful primer on gnuplot, happy graphing! As part of the JISC Open to Change project I’ve been working on a data store and public API for time-series data. At the moment it’s just got electricity meter data, but it would be great if we could include other types of data. Do you think it’d be possible to get hourly or daily usage statistics (e.g. OWL-Visitor, Eduroam, and network usage) to load into the store?